The Afterschool Training Toolkit is available online free of charge. The following resources can be used with the online Afterschool Training Toolkit to give you the resources you need to build fun, innovative, and academically enriching afterschool activities. The goal of Gathering and Sharing Information is to help students learn to collect, evaluate, and effectively communicate digital information, while being mindful of safe and responsible Internet conduct. Gathering and Sharing Information encompasses how digital tools are used to gather, analyze, share, and communicate information with others. The World Wide Web and other electronic tools can provide ways for students to collaborate, communicate, and share ideas with peers and experts nearby or in distant communities. Consult with the school-day teacher to see if he or she has ideas for a collaborative World Wide Web activity, or ideas to enrich a specific academic content area. For example, electronic pen pals, (sometimes known as a "key pals" or "e-pals") help improve writing and communication skills. Consider an online collaboration with a science institute with students across the United States who collect and compare data about wildlife migrations. Alternatively, students might collect and analyze original data on a problem, question, or concern in their community or school. Work with students to develop ideas for a project that interests them. Involving students in the planning process will increase their sense of ownership and participation in the activity. Form small teams or groups that are appropriate for the activity and your students' age level. As the project progresses, make any necessary adjustments and look for extension opportunities. When the project is complete, evaluate and plan the next one. See the Resources section for examples of projects you can replicate or join as a collaborator. Remember that assessing student skills, completing the activity, and determining computer needs are all part of the planning process. Getting Started: Considerations for Activity Planning (PDF) will help you get underway. Gathering and Sharing Information works because students initiate and direct their own learning. They observe, record, and analyze data, process reports and share their findings with others. Great afterschool lessons start with having a clear intention about who your students are, what they are learning or need to work on, and crafting activities that engage students while supporting their academic growth. Great afterschool lessons also require planning and preparation, as there is a lot of work involved in successfully managing kids, materials, and time. Below are suggested questions to consider while preparing your afterschool lessons. The questions are grouped into topics that correspond to the Lesson Planning Template. You can print out the template and use it as a worksheet to plan and refine your afterschool lessons, to share lesson ideas with colleagues, or to help in professional development sessions with staff. What grade level(s) is this lesson geared to? How long will it take to complete the lesson? One hour? One and a half hours? Will it be divided into two or more parts, over a week, or over several weeks? What do you want students to learn or be able to do after completing this activity? What skills do you want students to develop or hone? What tasks do they need to accomplish? List all of the materials needed that will be needed to complete the activity. Include materials that each student will need, as well as materials that students may need to share (such as books or a computer). Also include any materials that students or instructors will need for record keeping or evaluation. Will you need to store materials for future sessions? If so, how will you do this? What do you need to do to prepare for this activity? Will you need to gather materials? Will the materials need to be sorted for students or will you assign students to be "materials managers"? Are there any books or instructions that you need to read in order to prepare? Do you need a refresher in a content area? Are there questions you need to develop to help students explore or discuss the activity? Are there props that you need to have assembled in advance of the activity? Do you need to enlist another adult to help run the activity? Think about how you might divide up groups―who works well together? Which students could assist other peers? What roles will you assign to different members of the group so that each student participates? Now, think about the Practice that you are basing your lesson on. Reread the Practice. Are there ways in which you need to amend your lesson plan to better address the key goal(s) of the Practice? If this is your first time doing the activity, consider doing a "run through" with friends or colleagues to see what works and what you may need to change. Alternatively, you could ask a colleague to read over your lesson plan and give you feedback and suggestions for revisions. Think about the progression of the activity from start to finish. One model that might be useful—and which was originally developed for science education—is the 5E's instructional model. Each phrase of the learning sequence can be described using five words that begin with "E": engage, explore, explain, extend, and evaluate. For more information, see the 5E's Instructional Model. How will you know that students learned what you intended them to learn through this activity? What will be your signs or benchmarks of learning? What questions might you ask to assess their understanding? What, if any, product will they produce? After you conduct the activity, take a few minutes to reflect on what took place. How do you think the lesson went? Are there things that you wish you had done differently? What will you change next time? Would you do this activity again? Students from across North America participate in an Internet activity on butterfly migrations through the Journey North Web site. Instructors should determine students' computer and Internet skill levels and select appropriate technology tools. Instructors should also have basic computer skills, including familiarity with the Internet and e-mail. Visit the Journey North Web site www.learner.org/jnorth/ to learn about current and future projects. Review the Orientation, this season's projects, and Teachers sections. Plan activities and prepare project materials recommended in the Journey North Web site. The Web site contains helpful suggestions and ideas that are appropriate for different students' ability levels. For links to selected resources, see the Resources tab. Reserve technology and obtain other materials that might be needed according to the project guidelines. Engage students with a dynamic introduction to the project topic that solicits their immediate feedback. State that each fall, millions of Monarch butterflies fly across North America and head south to a remote location in Mexico. Then ask, Why do you think they migrate to this part of Mexico? Tell students that the butterflies also return to their original home each spring. Follow that by asking more questions: Why do they return home each spring? Do you remember seeing these butterflies in your yard during spring or fall? Did you think that they might be just traveling through—on their way to or from Mexico? Elaborate on the topic of migration as appropriate for the age and grade level of your group. The Journey North Web site offers practical suggestions for this discussion. Explain how the activity of tracking the butterflies' migration path will be carried out as a collaborative project with other students across North America. Tell students that they can e-mail sightings and other data to the larger community of participants and compare experiences with them during the migration. Explore connections between natural and man-made phenomena as a class. Explore maps, photos, and other resources on the Journey North Web site. Depending on the age level of your students, you may choose to include additional research on the Internet to learn more about Monarch butterflies, including the length of their migration routes, their life cycle, their host plants and predators, and how they can be tracked as they migrate across the U.S. to their winter home in Mexico. Ask students to compare Monarchs to other insects and migrating wildlife, as well as to other butterflies. Have students collect weather data, read postings from other students on the progress of seasonal migrations, and watch for the appearance of Monarch butterflies. Read about fields and cities that the butterflies fly over to learn about some environmental conditions that threaten their safety. Following the Journey North guidelines and suggestions, have students create electronic journal entries. These will help in assessing student understanding. If time allows, have students create a project portfolio to collect, record, and display qualitative and quantitative observations, life cycle studies, weather information, maps, research findings, and more—all in one folder. At the end of the season, the portfolio showcases all student work on the Journey North Web site. Encourage students to make connections during the course of the lesson with scientists, naturalists, or others in the community who may be involved with similar work. You may facilitate dialogue by inviting an expert to the classroom or arranging a question-and-answer session using e-mail or the Internet. Students use yarn and metric rulers to measure the lengths of their smiles. Then they present their findings, using digital pictures to enhance their presentations. Instructors should determine students' computer and camera skill levels and select the appropriate technology tools. Instructors should also have basic computer skills, including a familiarity with digital cameras, electronic spreadsheets and calculation formulas, and word-processing software. Test and practice camera functions. Review the electronic spreadsheets and word-processing software functions. Prepare an electronic spreadsheet that will be used to compile the data. Rehearse the activity at least once. Ask the following series of questions and discuss their responses. How big is your smile? Who has the biggest smile? How can we measure and then compare the smiles of everyone in the group? How could we describe the length of something (that is, units of measure)? Explain that students are going to become "researchers" to learn more about children's smiles. Ask what they think they will discover. For example, do girls or boys have bigger smiles? Do older children have bigger smiles than younger children? Explain that to find the answers, they will need to collect and analyze some "data." Present the steps, and mention that they are basically the same for all researchers and scientists who are interested in finding out about things. Elaborate on the steps as necessary. Share what is learned and plan next steps. You can write the steps on chart paper or on the board and point out the steps as the activity progresses. Explain that students will work in pairs to measure their smiles and then use computer technology to compare collected data. Introduce metric measurements, including "centimeters" and "millimeters," as well as the measuring tool they will use. Using a piece of yarn, have each student measure his or her partner's smile straight across from corner to corner. Transfer the yarn to a ruler and record measurements onto a worksheet or directly into the computer in both centimeters and millimeters. You may choose another unit of measure if desired. Have each student take a picture of his or her partner's smile. If you wish to document the activity to share with other instructors or parents, ask one or two students to operate the video camera (optional). Record and analyze the data. Discuss how to create an electronic spreadsheet. Decide how to set up the rows and columns of the spreadsheet and assign names to each. Discuss calculations and formulas. Have teams enter their members' data into the spreadsheet. Once data are entered, show the data table of all students' smiles and ask who has largest smile, who has smallest smile, and how many have the same size smile. Introduce the term "average" and how it is computed. Show how the electronic spreadsheet application can automatically figure the average. If appropriate, introduce the terms "mean," "median," and "mode." After collecting your data, use the graphing capacity of your spreadsheet program, or enter your data into this free graphing tool, http://nces.ed.gov/nceskids/graphing/. Discuss students' findings and make charts from the data. Ask each student to write an account of the activity and include a digital picture and the metric measurements of his or her smile. Share stories, pictures, and smile data. Evaluate the successful completion of each student's work. Use problems in the data collection or analysis as a valuable learning opportunity. Emphasize that this happens in real science experiments, too. Students and afterschool instructors work with community members to test characteristics of creek water, using handheld computers to record data and digital photography to document their activities. Duration: This project could last at least two months. The length of daily sessions will vary according to your timeline. Some sessions will last longer than others, and some may be repeated. This activity is flexible enough to let afterschool instructors decide how much technology to incorporate into the lesson. If your program has the equipment or resources to purchase equipment, students can use water probes to test water and record their results on handhelds or laptops. If this is the first time you are completing this project, you can start with simpler, less-expensive materials. Once you decide whether this project is suitable for your program, you can invest in more expensive materials. See the project's page on equipment for more information to make your decision (www.k12science.org/curriculum/waterproj/equipment.shtml). Instructors should determine the skill level of students and select the appropriate technology tools. Instructors should also be familiar with any software or equipment used in the lesson, or enlist the help of a volunteer who is. Study thoroughly the collaborative online project, The Global Water Sampling Project: An Investigation of Water Quality at www.k12science.org/curriculum/waterproj/index.shtml. This project is the basis for this lesson. On the first day of the project, arrange for a community member to come talk with students about water quality. This can be an environmental scientist, chemist, biologist, etc., from the city parks department, college, city or state water quality board, or the Environmental Protection Agency. Use this lesson plan as well as the online project plan and dates to set up a project timeline. Spend time researching local environmental issues and identifying some potential locations to collect water samples. Communicate with parents regarding project plans, including timeline and field trips. Collect the necessary materials for the science and technology portions of the activity. Practice using the materials. Adults must supervise all data collection and cleanup. Choose the area wisely, looking for the safest environment for students. Students must wear gloves for cleanup and goggles when any water-testing chemicals are used. Do not collect data when a storm is forecast; observe the sky for rain showers and thunderstorms. Avoid streams in high water. Have a first-aid kit, sturdy shoes, proper clothing, and protection from the sun for all outings. Engage students in an environmental study. Invite a guest speaker to discuss and share pictures of local streams and/or ponds showing the environmental conditions of the area and explaining the impact of water quality on a community. Take students online to The Global Water Sampling Project: An Investigation of Water Quality (www.k12science.org/curriculum/waterproj/index.shtml). Discuss with your students the collaborative project and what it entails. Lead students in conducting Internet research about the site where they will complete the project. If your students will be participating in creek restoration or cleanup as part of the project, encourage them to research that topic as well. To create a record of their work, students can keep electronic journals, either with word processing software or blogs. Have students look at the online project Web site and plan for your field testing. Develop a hypothesis (a proposal that students will try to prove or disprove with the data) on water quality and what students expect to see in the data. Have students test water for the pH level (acidity), nitrates, dissolved oxygen, and other physical parameters. Follow the online project guide for specifics on sample collection. Record data on a handheld or laptop computer spreadsheet. Document your field testing by taking pictures with a digital camera. Invite students to add pictures to their electronic journals. Submit data to the project Web site. Log on to the Global Water Sampling Project Web site and submit the data you collected. Upload pictures to the project Web site. As a class, analyze the data you collected and decide whether it proves or disproves your hypothesis. Have students use technology to share their findings by posting comments in the project discussion area, contacting an expert in the resources listed on the project Web site, or writing in their electronic journals. Investigate opportunities for students to participate in creek restoration projects and measure the impact of their work. Invite local or state environmental agencies to talk to students about careers in environmental sciences. Have students create final reports and displays, and invite families and community members to see their work. For more information and ideas to support this lesson, see the Resources page. Ringstaff, C., & Kelley, L. (2003). The learning return on our educational technology investment: A review of findings from research.San Francisco, CA: WestEd Regional Technology in Education Consortium in the Southwest. Jonassen, D. H., & Stollenwerk, D. (1999). Computers as mindtools for schools: Engaging critical thinking.NY: Pearson Education. The following resources are related to the "Monarch Butterfly Watch" sample lesson. Journey North engages students in a global study of wildlife migration and seasonal change. K-12 students share their own field observations with classmates across North America. Orientation, Teacher Tips, Sightings, Data, and Maps are included in the web site. Materials in this site were prepared in part of the Department of Education's International Education Initiative to help teachers use the Internet to "reach out" globally. Educators will find many projects and suggestions to begin or expand classroom projects that reach across the globe. The Global Schoolhouse is the original virtual meeting place where educators, students, parents and community members can collaborate, interact, develop, publish and discover learning resources. Find multiple projects for student collaboration and interaction. Travel Buddies is a popular activity for young children. ePALS Classroom Exchange® maintains the Internet's largest community of collaborative classrooms engaged in cross-cultural exchanges, project sharing and language learning. ePALS is also the leading provider of school-safe emailTM, blogs, eMentoring and web-browsing technology for the global educational market. ECC is a free service to help teachers link with partners in other cultures and countries for email classroom pen-pal and other project exchanges. Since its creation in 1992, IECC has distributed over 28,000 requests for e-mail partnerships. 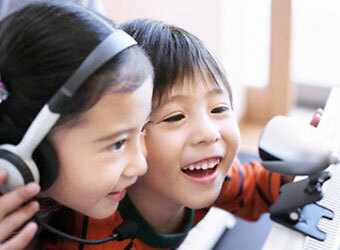 All projects in iEARN are initiated and designed by teachers and students. As part of iEARN's mission to improve the quality of life on the planet, iEARN projects involve a final "product" or exhibition of the learning that has taken place as part of the collaboration. Previously known as MarcoPolo, this site offers a searchable database of lesson plans and resources focusing on literacy, education, and technology. The following resources are related to the "Digital Smiles" sample lesson. The following resources are related to the "Global Water Sampling Project" sample lesson.